My family always goes camping in the middle of August to pick raspberries and watch the Perseid Meteor Shower. 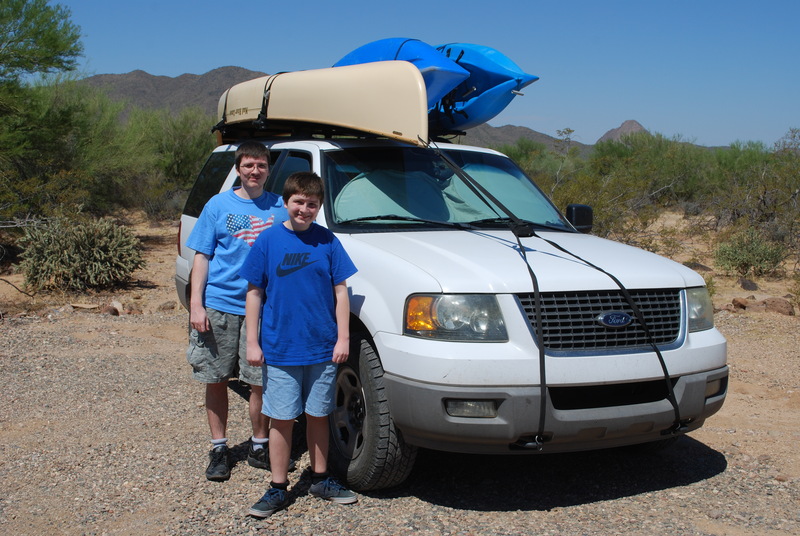 So we packed our Ford Expedition and drove from our house in the desert up to the forest. On the way there, we stopped at a place called Garlic Paradise just off the freeway. They sell lots of food with garlic in it – like bread, pickles, spaghetti sauce, marinades, salad dressing, and salsa. They had a small dog that liked to be petted. After that, we went into a Bashas’ grocery store in Verde Valley to buy snacks and drinks. Then we started driving up the hill to the Mogollon Rim, a long sandstone cliff topped with Ponderosa pines that runs across northern Arizona. We saw some smoke in the distance; I guess there was a fire somewhere. We turned onto a dirt road and went past a shady spot with lots of ferns. 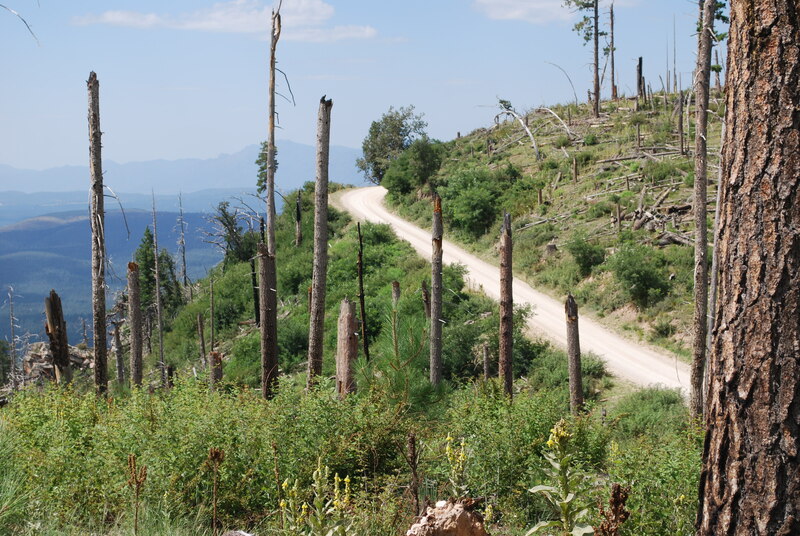 We also drove through an area where the trees were all dead from a wildfire that happened years ago. We got out and stood at the edge of the rim, about 2,000 feet above the valley. I asked my mom if anyone ever fell off there like they do at the Grand Canyon, and she wasn’t sure, but a week later she saw on the news that a man had been killed when he slipped and fell off the Mogollon Rim. 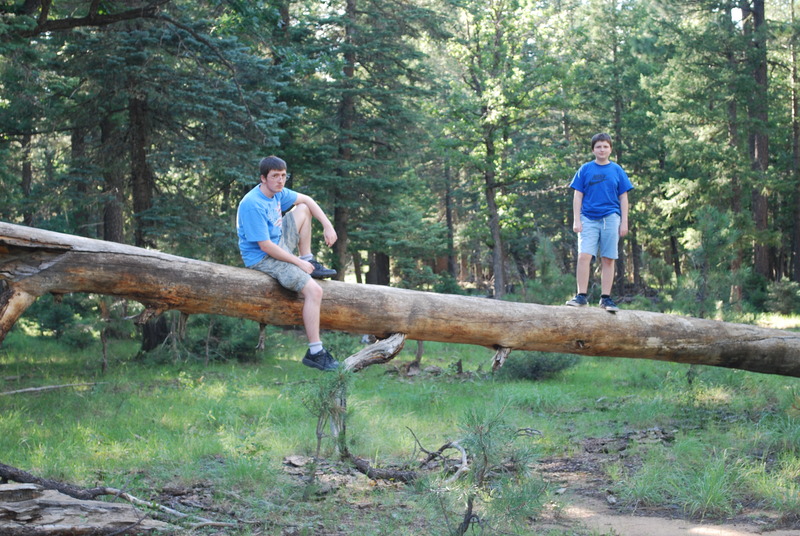 After looking at the view, we drove to our favorite place that we’ve been going to for years, where there is a big old log to climb on and a pine tree that had been struck by lightning. Back when we first saw it, the splintered wood was still fresh and smelled like lumber, but now it’s all dry and decaying. We had a hard time finding a good camp site. One spot was covered with bees, and another was full of mosquitoes. We drove a bit farther and came across a herd of deer. We finally found a nice clear camping area with a good view of the sky. The stars were super bright, and the Milky Way looked so cool! We didn’t see very many meteors, but we did see a big one streak across the sky just before we went to sleep. The next morning we went off on another dirt road because it was supposedly a short cut to a lake. We came to a series of small canyons that had nice green leafy trees and we had a picnic there. Finally that afternoon we got to the lake. 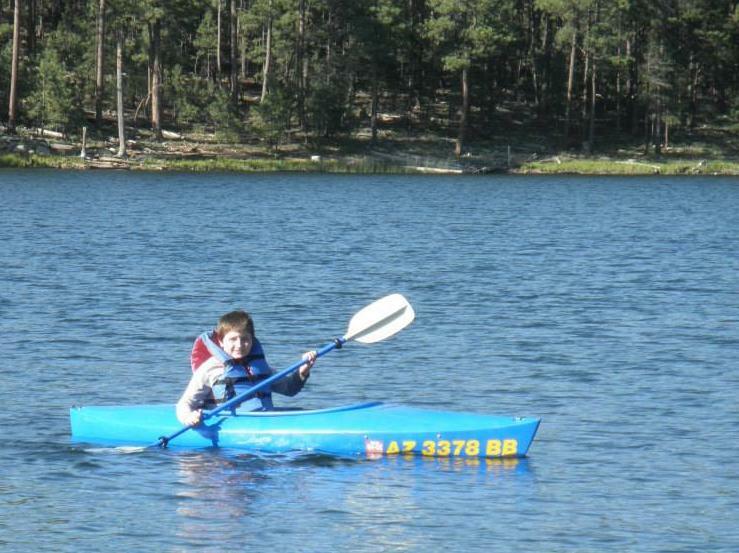 My dad, mom, brother and I went out on the water with our canoe and kayaks. We boated for a while until we got to what we thought might be an island but it was actually a peninsula, and we went swimming. The water was really cold. We got tired and hungry, and drove to a town so we could eat a pizza. It was already dark by the time we were done, and we still had to find a place to set up our tent. On the second night of camping, we saw some lightning off in the distance. When we woke up, we drove back onto the rim road and saw another good view of the valley way down below. We found a side road that had a bunch of berry bushes and we picked some raspberries. There was a tiny horned toad way up on the rocky rim. I thought they only lived in the desert. We also saw lots of ants around there, and they build more creative structures than the ones in our yard. 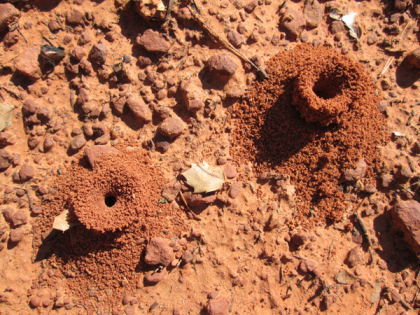 These ant hills were sculpted into various shapes, kind of like pottery made with little granules of red clay. [Click on photo at left to enlarge the view] When we reached the end of the 40 mile long dusty Rim Road and got back onto the pavement, we knew it was time to head out on the highway toward home. The return trip went a lot faster since we didn’t stop anywhere; it took between 1½ to 2 hours. As we dropped down in elevation, we could feel the rise in temperature. 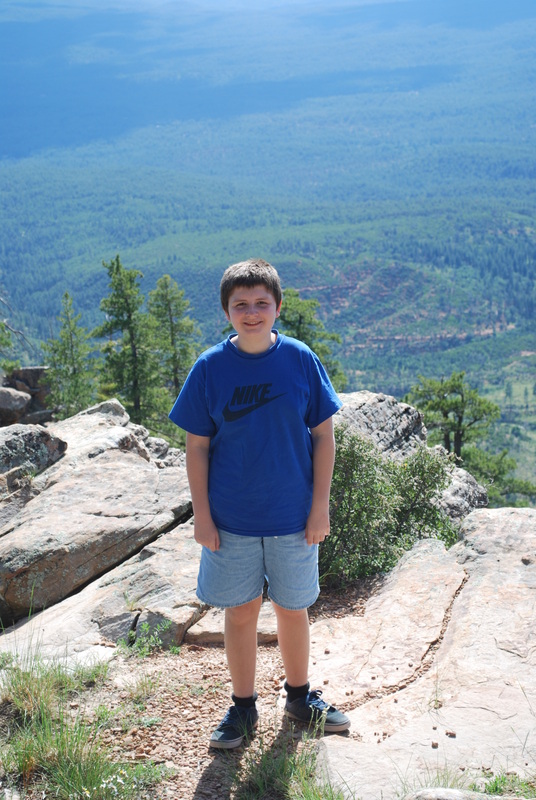 It was 70 degrees up on the Mogollon Rim, and it was 100 degrees at our house. I was glad to finally get home even though I wish it wasn’t so hot! But it was nice to have a cool weekend camping trip.